Looking for a quiet, private, peaceful hideaway for the weekend or longer? 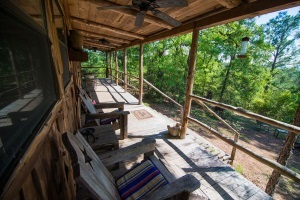 You will love The Best Little Cabin in Texas, hidden on 300+ acres in the middle of the beautiful Lost Pines of Texas between Smithville and Bastrop, only one hour from Austin. 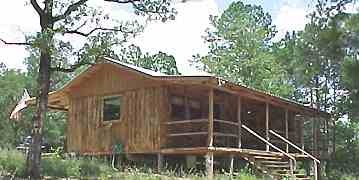 Our cabin, located on the highest point in the county, was completed in January of 2000 and offers its guests a memorable nature experience with plenty of native and migratory birds, an occasional deer and possibly a wild turkey, fox or even a bobcat. You will delight to the nightly, eerie yapping of the coyotes and the supurb star gazing because of no city lights. 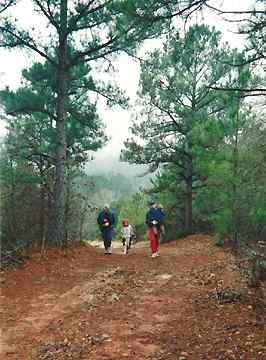 Guests love going for a walk in the woods at our cabin. We have 300+ acres which offer you plenty of space and privacy. 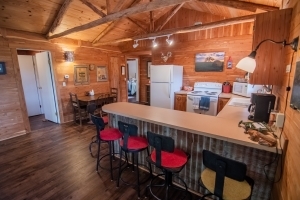 The cabin is on property that has been in the same family since the early 1800s and our guests are encouraged to walk, ride (bring your bike) and enjoy the serenity of the area at their leisure. You are encouraged to bring a cell phone as there is no phone on the premises. 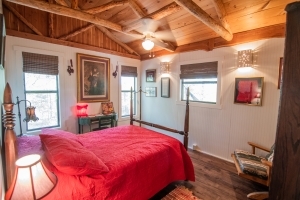 The Best Little Cabin in Texas has two bedrooms, a double bed in the Madam's room and a queen in the second bedroom. 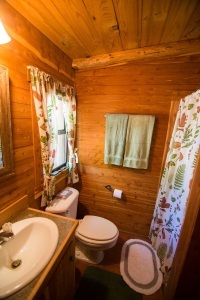 The cabin has two bathrooms. There is a sleeper sofa in the living room to accommodate two more people. Central air conditioning and heating keep the cabin comfortable in any climate. 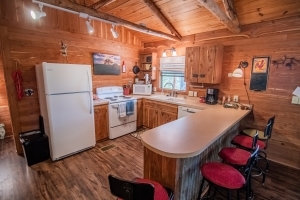 The owners of the cabin, Terry and Dianne James, are antique dealers and have decorated the cabin with a great collection of antiques, some of which are priced for sale. The second bedroom, known as "Ode to the Toad", pays humorous homage to our beloved local Endangered Species, the Houston Toad. This toad, about the size of a silver dollar, mates during the late spring and makes one heck of a mating call. May their numbers increase. You will find the construction of our cabin comfortable, attractive and interesting. 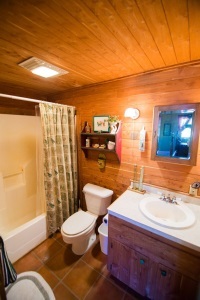 The cabin's interior walls are of cedar. The exposed pine rafters add an extra charm to the interior. In the photo above, the front and back doors were left open to enjoy the gentle breeze that blows through the cabin. The kitchen is fully equipped with paper products, salt, pepper, sugar, coffee ( bring your own if you have a favorite), all utensils, dishes, pots and pans, dishwasher, microwave, blender, etc. , as well as an outdoor grill. Guests need only bring what they intend to eat and drink. The counter has five stools, and a dining table with chairs provides plenty of seating while eating. TV with cable in living room. You will want to spend a lot of time on our comfortable full length deck along the back of the cabin. 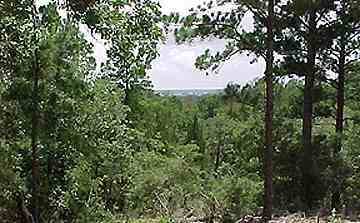 Through the giant pine trees you will be able to look over the Colorado River Valley to Smithville and beyond. Relax on the deck to enjoy the gentle breezes and the sounds of nature at its finest. Have you ever taken a nap in a hammock? Take a nap in our hammock and ponder what lies over life's next hill. You will love it! You might get a glimpse of the Black-Bellied Whistling Ducks that are nesting somewhere nearby. These birds are quite rare for this area. The beautiful Painted Bunting is only one of many birds residing in our woods. Walking/Biking Tour of Historic Homes in Smithville and Bastrop - See fine examples of Victorian, Queen Anne, Classical Revival and Greek Revival. 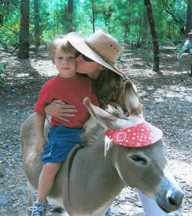 Shopping at Smithville and Bastrop - Antiques, Gifts, Souvenirs, Clothing, Crafts, Books, Jewelry, etc. Visit the Hyatt Lost Pines Resort and Spa for dinner, golf and their canoe/kayak operation on the Colorado River. If you want peace, quiet, and privacy then this is the place for you! 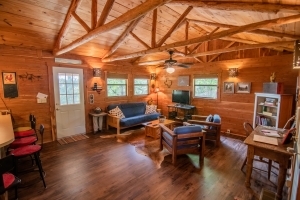 The entire property is beautiful and the cabin is perfect for 2-4 people. We enjoyed relaxing in the rocking chairs on the back porch (with coffee in the mornings and wine in the evenings) and had a great time hiking, biking, and exploring during the day. Dianne was a fabulous host and answered all of our questions about the property and cabin. We loved it and wished we could've stayed longer! Thank you again for your hospitality! We had the perfect weekend and hope to return soon! It was great meeting you too! Many thanks, Rebecca and Levi. WOW! What a beautiful, awesome, & warm place you have. The comfort of home - then 5 steps out and all the wonder of nature. 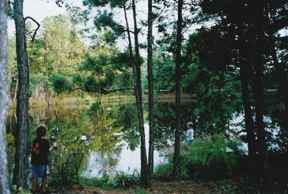 The ducks, squirrels, a deer, turtle, wildflowers, pond, dewberries, pine trees, views, butterflies, .....on & on! Thanks for all your hospitality. This was a great place for our honeymoon. I'd recommend it to anyone. Heaven on earth....it starts here. Each year my 2 sons and the spirit of our eldest, who recently passed on 5/20/01, have spent Father's Day at a retreat away from our wives. Here, we relaxed, cooked steaks over your fire pit, toasted to our lost son with fine wine and smoked our annual cigar on your "Best Little Porch" & reminisced until the wee hours. Your nostalgic decor, apparent great sense of humor and uplifting environment were a perfect closure for our tragic past month. Thank you and bless you. - William O. Ash, Colonel USAF Ret. The cabin is what we've been looking for-- we have searched for a wilderness cabin from Texas to Canada, the one is the "Best". Saw lots of birds -- we do not have the pileated woodpecker where we live. "Celebrating our 50th Anniversary." 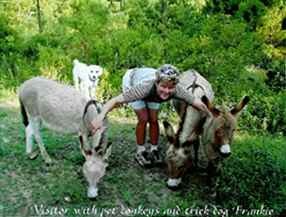 Guests enjoying our pet donkeys. $170 per night, two night minimum stay. Please no smoking in the cabin and take extreme caution outside because of forest fire hazard. Cabin in Texas may be habit forming.